I don’t blog about politics. We’re not going to discuss which candidate has bigger binders full of women or was less awake during the first debate. In fact, for one blog entry I’d like to discourage conversation. However, I am curious about who you all plan to vote for next week (sorry, international readers–this is for U.S. readers only). I’m curious if this blog attracts readers from both political parties or if you all sway heavily to one side or the other. Heck, I’m curious if you all will even answer this poll! The following poll is completely anonymous–I truly have no way of tracking who you are. Thanks for your vote, and if you’re on the east coast, I hope you’re safe! This entry was posted on Monday, October 29th, 2012 at 11:24 pm	and is filed under poll. You can follow any responses to this entry through the RSS 2.0 feed. 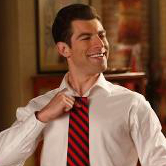 I cannot possibly express my excitement and pure joy that you have a photo of Schmidt in this post. I do think this is an interesting thought about what political leaning people have that are attracted to your blog. But I also wonder what type of political people are attracted to any blog that is not political oriented by nature.